Today I lost a great and trusted business partner. I first met Yellow Number Nine when she was just a few month old. It was in the spring of 1999 that she came to visit our farm with a group of six others. She did not stand out from the pack anything special. Short, small framed and wide, she would not have been anyone’s top choice in the group. But what she accomplished would soon leave the others behind. She had her first calf at two years old (something we expect all our working girls to do). She had another calf at three (something that a lot of ladies fail to do because they are feeding their first calf and expected to conceive another, all while still growing). And she continued to not miss a year until 2015. That makes 15 calves in 16 years. So when she didn’t give me anything last year, I let it slide. Then last fall when we moved the herd across the road I doubted that she would make the move back, but she did (slowly). When the herd moved to barn, I doubted she would walk out under her own strength, but she did (slowly). And when I she didn’t calve this year I was going to let it slide again, but today, she calved. But it was too much for the old girl. So the cow that lived on our farm for one less year then I have and had 15 calves in 16 years of production went to the big pasture in the sky today, where the grass always has a spring flush, the mineral tub never runs empty and the creek always runs cold. She did leave me one last thing to remember her by, her 16th calf. Mark Your Calendars! Open Barn and Chicken Pick Up Is Scheduled. June 3rd is the date! Mark it down now, 6PM to 9PM. Go to our Facebook event https://www.facebook.com/events/1113719392067902/?ti=icl and tell us you’re coming. Please bring your friends and share it on Facebook. Our first batch of pasture raised chicken will be available on June 3rd. It can be picked up right on our farm (processed off farm that morning) that evening and is being offered at $16 for a 4-5 lb dressed bird. While here for your birds we will also have available our beef by the cut/lb or by the 1/8 beef (new this year). You can also try some of our beef products that you may have never tried in your 1/4 or 1/2 beef. Items like our beef breakfast sausage, summer sausage or beef snack sticks. Plus, we plan to have the grill fired up, filled with samples of our beef and chicken. 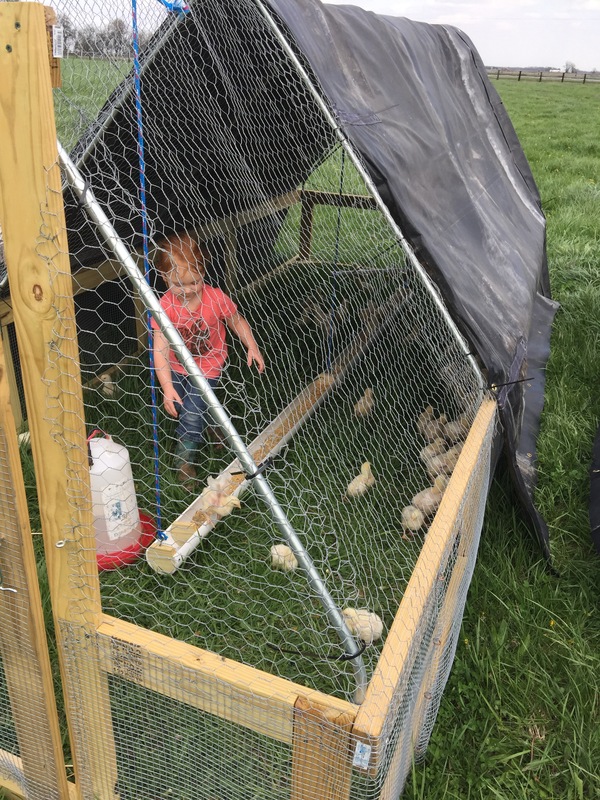 While here (time and weather allowing) we would love to show you and your family around the farm a little so you can see how Food is Raised Right. The Chicken Tractors are on the move! The chicken tractors are out in the pasture!! What? You don’t know what a chicken tractor is? 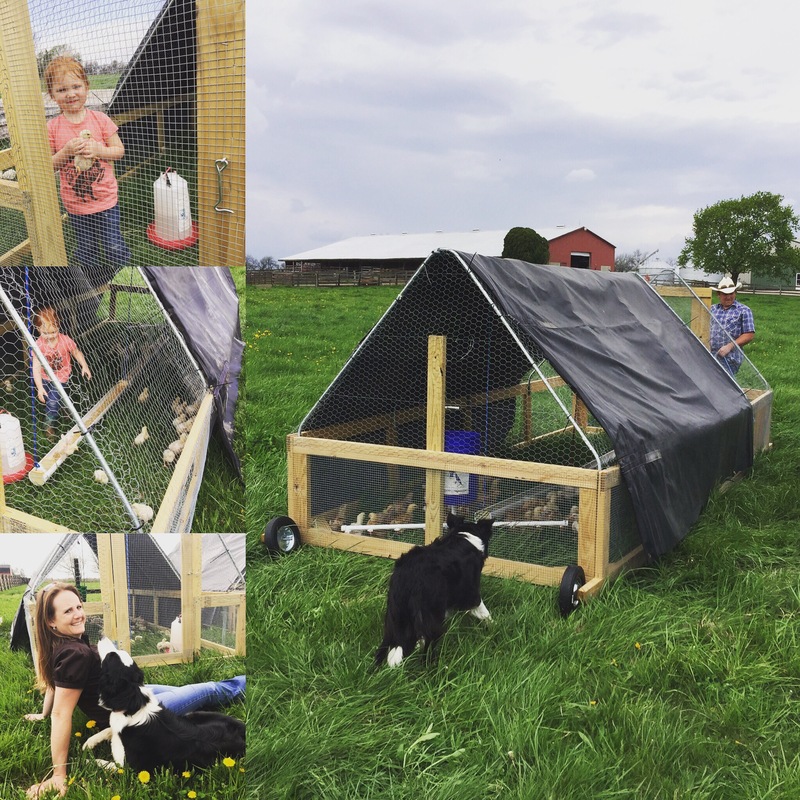 A chicken tractor is a way of raising chickens outside, in open air and on pasture. It allows the birds to do what birds naturally do, eat grass and scavenge for bugs. An as a bonus they’ll drop their droppings on the ground where it will fertilize the soil and make the grass grow stronger. That, in turn, will make more bugs and worms want to live there…and the chickens can then eat them next year. So as Walt Disney would put it you have the circle of life – Hakuna Matata. These birds will be moved daily (the whole pen moves, hence the name “tractor”) so that they can browse and decide what they nibble on and they do not have to stand in their own droppings. They will also have a natural free choice feed available to them with protein, vitamins and minerals. Now many of you may be saying that you buy “free range” chicken. If you don’t want me to burst your bobble stop reading now… anyone left? Good, for those of you still here let me explain what that really means. When chicken is labeled as free range it simply had to have access to the outside for the last two weeks of its life. So, in these large factory farms where they raise hundreds of thousands of birds in confinement they simply open a small door in one end of the barn. Most of the birds probably never go out the door, not even once (a great book that covers this topic is “The Third Plate” by Dan Barber). In fact, I’d bet the most fresh air these birds get, is on the ride to the factory processor (but that’s a topic for another blog). Stop the weather rollercoaster! I want off!!! The bees are flying, the apricot tree is blooming, the bulb flowers are starting to push through the ground (as well as the thistles) in the flower bed and now it’s 27° scheduled to go down to 13° on Tuesday, and snow. Over the last few weeks we’ve been preparing for warmer weather because we thought it was here. Boy, were we wrong. Only a week until the first official day of spring… Bring. It. On. We sent out our top picks for our new logo last weekend and received mixed reviews. I really thought picking one would be more simple. We figured we would see one and just know it was the one for us. So, we started bothering everyone we knew for their opinions and found out that most of you felt the same way. 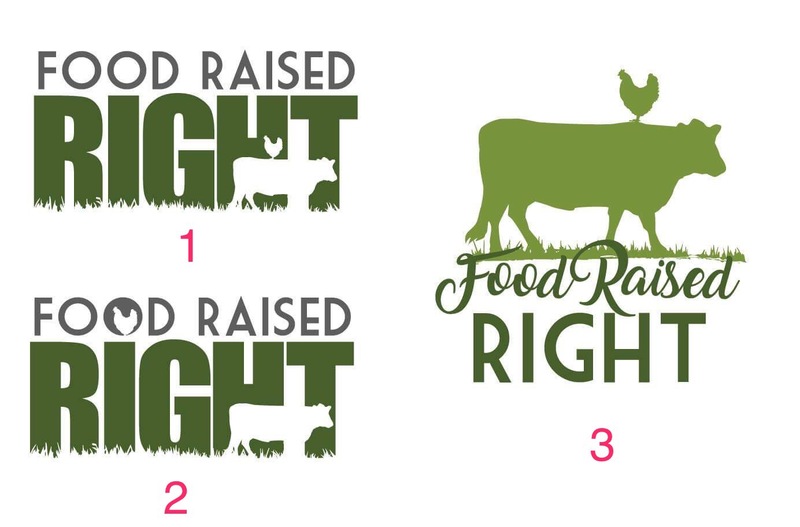 Below are our top two choices with an addition of a chicken on the two on the left (which several people recommended). Let us know your thoughts so we can stop worrying about it, and stop bugging you! 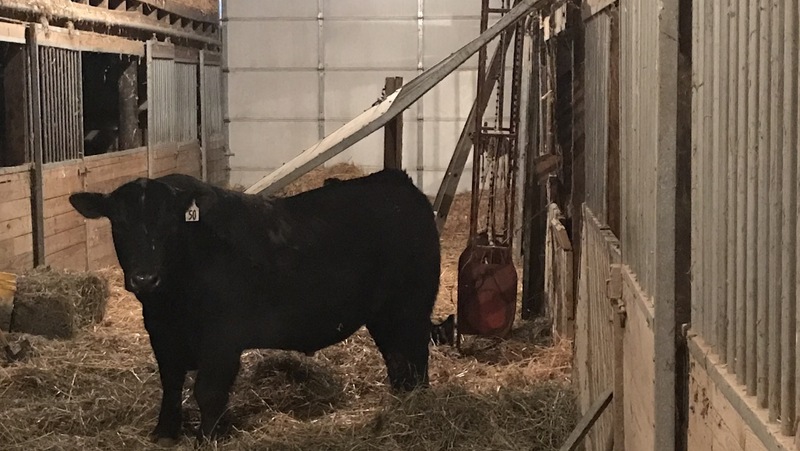 Our New Herd Bull Is Home… He Just Doesn’t Know It Yet. 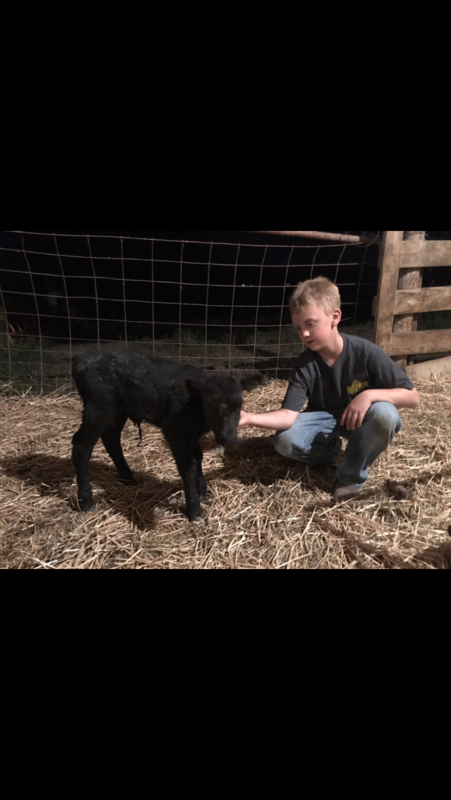 We bought a new Angus bull from Myers Angus Farm in Kentucky on Saturday. We keep daughters that are born here from the bull and don’t want to breed those back to him. So, every 4 years or so we replace him with a new one. 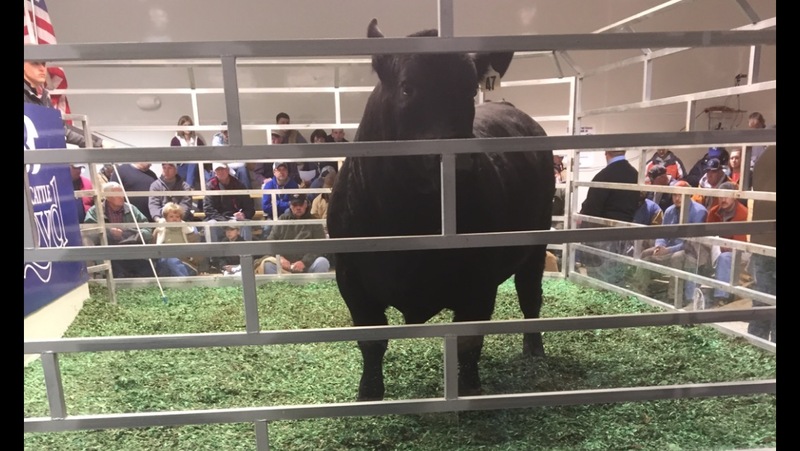 We got the bull unloaded and penned up Saturday night when we got home and all seemed good until I walked out Sunday morning to find him standing in the aisle. He had torn out the gate and many of the fence boards. The power these animals have is sometimes scary, even to someone that works with them daily. He is now in a more secure pen… at least for the time being. We have a limited supply of beef available now, in individual cuts, from a calf that was just harvested and we just renewed our retail food permit with the County Health Department so, unlike the guy that comes to your door selling beef from the back of his truck, you know we are legal. Call, text or email today for pricing and availability. If you enjoy reading our blog, sign up for our newsletter at www.foodraisedright.com. We have done it. We bought the farm (at least a farm). We have been renting and farming the family farm for the last 4 years but have never owned land of our own. The 40 acres we purchased from the Price Family sits right next to our house and borders the family farm on two sides. The whole process started years ago with us bugging Mr. Price to sell it to us. Apparently all our persistence paid off and he stopped by one day a few years ago saying that he had put us in his will as having the “first right of refusal”. This basically means that when it is sold we get to decide if we wanted it at the price they were selling. After Mr. Price passed away about a year and a half and Mrs. Price last summer we had to decide how bad we wanted it. We had to decide if the cost of the land (which was a lot, more than a lot!) outweighed the repercussions if we didn’t. If we didn’t, we risked the land never coming up for sale in our lifetime again or someone might begin farming it with practices we wouldn’t be in favor of (did I mention our well that supplies drinking water for our house is about 20′ from the edge of this field). If we did buy it we can look forward to farming it for the next 30 years (life of the mortgage) with little to no profit. My wife and I will only be 69 and 68 respectively. At least our kids might see profit. So with the addition of this property, it brings our total acreage farmed to right around 365 acres. 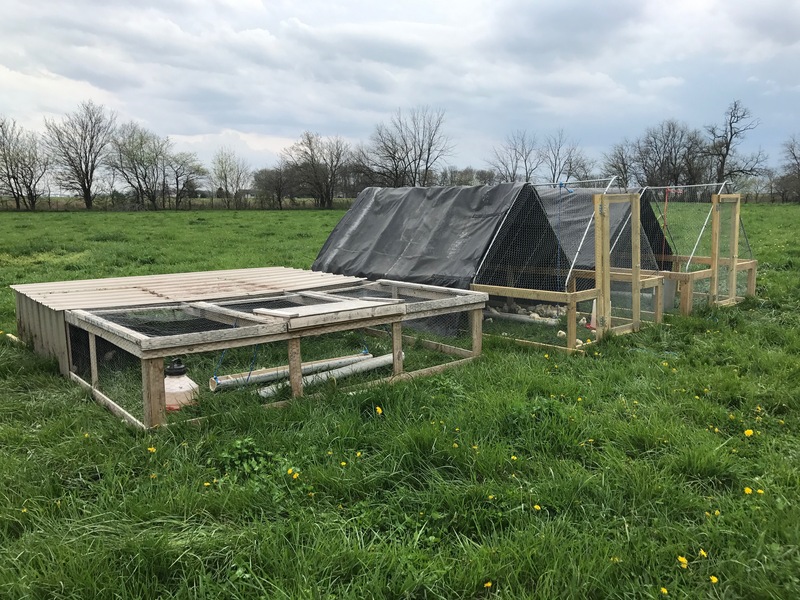 So, with the growth of this blog, it is now literally seen by tens of people, I’m considering naming this blog “An acre a day” as in, 365 days a year. At least I will get a day off once every 4 years on a leap year. Keep in mind, we’re still taking orders for quarter, half and whole beef as well as pasture chickens. Our local raw honey (yes, from our farm) is available now. Welcome to the new Food Raise Right Flog. I will try to post a new blog at least every other Monday. This is very fluid right now, in that I don’t really know what I’m doing here, so let me know if that’s too often or (however unlikely) not often enough. I am new to this blog thing so if any of you ever have any suggestions of what I could write about that might interest you just let me know. Also if you ever has anything of interest that you feel like sharing, let me know that too. I will be mostly focusing on the activities around the farm. If you follow us on Instagram or Facebook there will be a little redundancy but we will be getting a little more in-depth here on the website (www.FoodRaisedRight.com). If you don’t follow us, then you should. I will try to give at least one recipe with each post using some of our product and some seasonal ingredients when available. 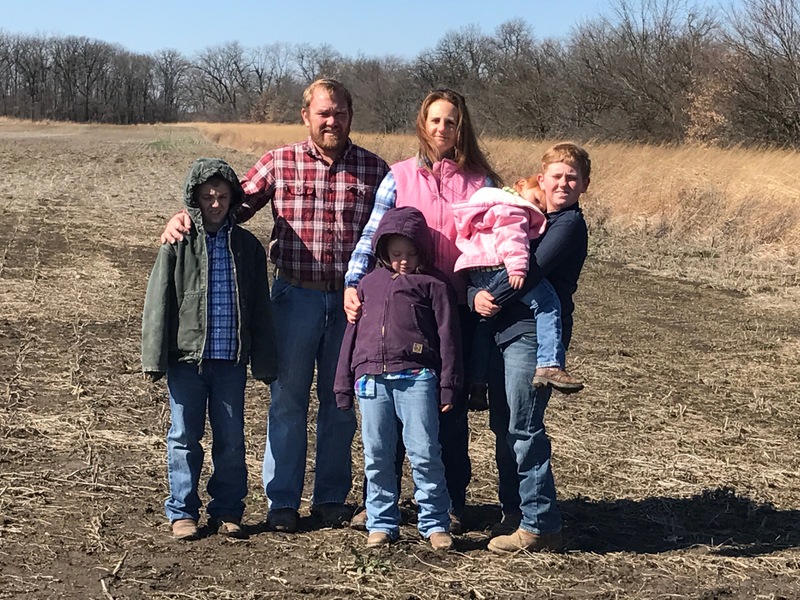 I can give a brief overview of any big news in agriculture that I think you might find of interest and of course I will give a shameless plug to our farm, Food Raised Right (formerly know as Natural Osage Angus Beef). The reason we changed the name was to better represent what the farm has and is becoming. I will also plug other farms that raise sustainable products to help us all eat more responsibly. 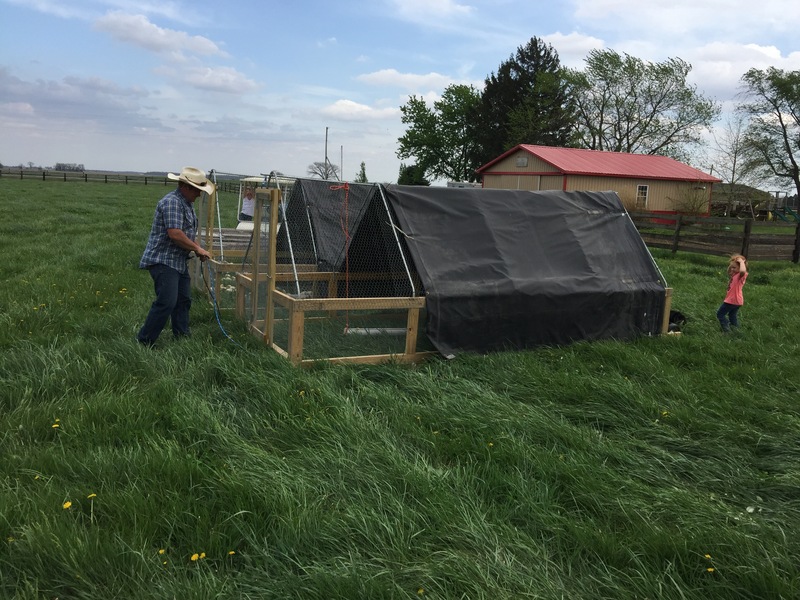 As this is the first blog I will give a little background on our farm and where we are headed. The farm is 325 acres located in Madison county, Ohio. We have raised many things here over the years but our focus up to now has been on our beef (that we raise from birth) that we sell in 1/4’s, 1/2’s and whole beef. Until 2 years ago we sold by the pound at local farmers markets and directly off the farm. We have been expanding our sheep herd and chicken flock to the volume that we will be able to include that in our products this year. Also, we have expanded our honey bee hives to the point we can now sell sustainable honey. In the future we are looking to head back to local farmer markets, and increase what we sell there to include lamb and chicken. We also are tossing around the idea of selling 1/8 beefs directly off the farm for those that don’t have the freezer space, don’t have the need for that much or just want to save more space for lamb or chicken. The trail ahead of us is not a certain one. There will be bumps and turns and the route we are planning now is likely to change. But with perseverance, faith, and your help we will all at least learn from the trail. Stay tuned – we’re making some great changes to better serve you! Stay tuned for our new blog coming soon! A Farmer is always working.